September 12, 1966: Zero Gravity Facility is so tall, objects dropped from the top experience a full 5.18 seconds of zero-gravity free-fall. The Zero Gravity Research Facility is a pair of towers built during the 1960s space race to study microgravity. Researchers poke at how combustion and fluid physics reach in microgravity, setting up the initial tests for further investigation aboard the vomit comet or the International Space Station. Objects are positioned with an overhead crane at the top of the vacuum chamber, connected to the control room with an umbilical cable. Over the next hour, a vacuum pump drops the chamber to 0.006% of atmospheric pressure (just 0.05 torr compared to the 760 torr of standard atmospheric pressure), reducing atmospheric drag to just 0.00001 g. The controllers remotely fracture a specially-designed bolt, sending the experiment into a 132-meter (432-foot) free-fall for 5.18 seconds. It then gets caught by a decelerator cart filled with polystyrene beads, hitting a peak deceleration of 65 g, or 65 times normal Earth gravity. The 142 meter (467 foot) long steel vacuum chamber extends 155 meters (510 feet) below ground level, with a 132 meter (432 foot) free-fall distance. 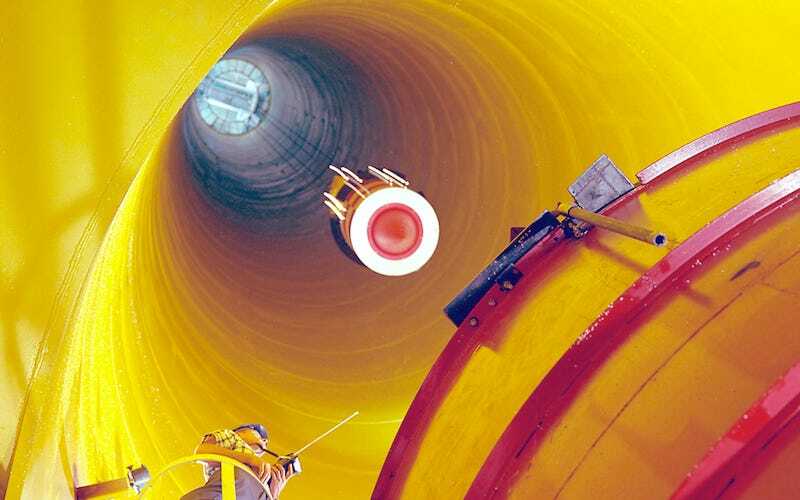 The 6.1 meter (20 foot) diameter tube is embedded within a 8.7 meter (28.5 foot) concrete-lined shaft. Objects are caught by a 3.3 meter (11 foot) diameter, 6.1 meter (20 foot) deep decelerator cart filled with 3 millimetre (1/8 inch) diameter polystyrene beads. The cart can dissipate the kinetic energy of a 1,134 kilogram (2,500 pound) experimental vehicle travelling at 50.5 meters per second (113 miles per hour). The Lewis Research Center has since been renamed to the John H. Glenn Research Center at Lewis Field in Cleveland, Ohio.